The Young Black Male | Cover Story | Style Weekly - Richmond, VA local news, arts, and events. Entering the new year, Richmond finds itself confronting an issue that had seemed to fade from the forefront, until it screamed out in the middle of 2003. How can we reach a generation of young black inner-city males facing perhaps the toughest challenges and choices of anyone in the city? What kind of future do they see, if any? What are their options? Where is their hope? Richmond is a city with big plans. Big, glitzy plans for new hotels, more tourists and a performing arts center. It is a city that won a Saks Fifth Avenue. A city hoping to show off for the Queen of England in 2007. It’s also a city caught up in challenges and distractions — City Hall scandals and a likely change in government structure. A static tax base and strained resources. A school system improving its SOL scores yet struggling with truancy and violence. A police department long plagued by vacancies and pulling itself out of an officer deficit. This is a city at a crossroads. Do we have time for people whose lives are at stake? 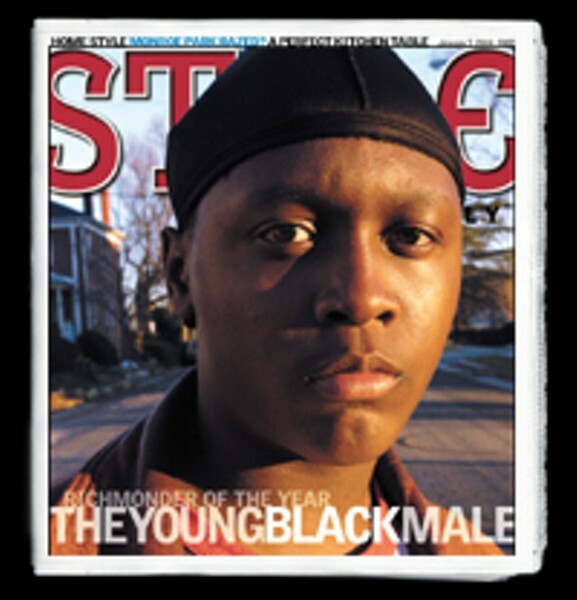 After considering the stories, people, events and general condition of Richmond in 2003, Style Weekly names the young black male as its Richmonder of the Year. During the last 17 years, many people have received the title — among them former Gov. L. Douglas Wilder, Downtown Presents Director Nina Abady and Virginia Commonwealth University President Eugene P. Trani. This year’s choice is fraught with difficulties, because there is a fine line between symbolism and stereotype. We would be foolish to refer to any group as a monolith, a mass of people likely to do one thing or another. There are enough misconceptions already. “The myth of the dangerous young black male is probably part of every major development decision in Richmond in the last 30 years,” says the Rev. Ben Campbell, pastoral director of Richmond Hill, a historic monastery and retreat where residents pray daily for the health of the region. “Why is Short Pump out where it is?” he asks. Many young African-American men feel the “stiffening up,” as one interviewee put it, from someone they might pass on the street or see in the mall. It is unspoken, like many racial issues that have clung to Richmond’s evolution. n Of the city’s 94 homicide victims, according to police reports, 73 were black men — or 78 percent. Of them, 45 victims were 30 years old or younger; 14 were not yet 20. One was a baby on Broad Rock Road, just five months old. n The Richmond Department of Juvenile Justice Services helps at-risk youth younger than 18 who come before the Juvenile and Domestic Relations Court. Of the 1,573 youth served in 2003, 71 percent were male and nearly 95 percent were black. The majority, according to the agency’s annual report, were young black men between 14 and 17 years old. n Gov. Mark Warner, launching his statewide Crime in Minority Communities Initiative Task Force in November, said that black males in Virginia were eight times more likely than white males to be victims of homicide, according to statistics from 2000, the most recent available. It seems overwhelming. The people trying to reach young black men — the police, the teachers, the ministers, the mentors — deal with an intricate and complex set of circumstances. Drugs and guns. Morals and values. Health and economic conditions. Education hurdles. Fatherless homes. Peer pressure. Pop culture. Robert Cavell, 14, a seventh grader at Mosby Middle School, talks of “beat downs” that occur at school just about everyday. “A group of people will go up and beat up one person,” he says, but it’s mostly gang-related. “It’s like having a dam, but you’re trying to fill all the holes,” says Harold Harris, who’s worked with children at the Salvation Army Boys & Girls Club in Church Hill for 21 years. Harris, raised by a single mom, has seen countless youth ages 6 to 18 during his years at the Boys and Girls Club. The young black men are the most vulnerable, he says, because they “lack so much.” Some of them end up making the right choices. Others don’t. For his part, Harris tries to reach them as early as possible. Peer pressure is as high as ever, Harris says — the allegiance to your “boys,” the old friends pulling you down. Guns are more available and drug-selling is blatant. Some of the year’s violent crimes struck in dramatic clusters. In late October, four incidents left seven people shot. Two of the victims — Martel Marrow, 15, and Travelle Terry, 16, both black, died. Then there was the Nov. 15-16 weekend — just days after City Manager Calvin Jamison introduced an anticrime plan — when five people were reported shot. Two of the shootings were homicides. Where had the city leadership been? In Jamison’s annual progress report on the city for fiscal 2003, obtained by Style, he made no mention of homicides or juvenile violence. Instead, he noted that rapes had declined 10 percent and simple assault cases were down 22 percent. Of the omission, Jamison told us, “The numbers weren’t there.” (By the end of the fiscal year June 30, there had been 45 homicides.) He received a 3 percent raise. Late in the year, he reacted to the crisis by convening special public-safety meetings with his staff and the community. Many community leaders, though, had seen this coming. “Clearly what we’re seeing is an increase, at least in lethal violence,” says Robert Cohen, a psychiatry professor who is co-director of the Center for the Study and Prevention of Youth Violence at Virginia Commonwealth University. The center is one of 10 across the country funded in part by the Centers for Disease Control soon after the shootings at Columbine High School. Police also are seeing younger suspects as well as victims. Are the youth different? Some observers say yes, pointing to a generation that grew into adolescence during Richmond’s violent peak in the mid-’90s. And many of the targets of Project Exile — an initiative that prosecutes certain gun-toting criminals with the stiffer penalties of federal court — are starting to return to the streets. Several Richmond policemen, who ask to remain anonymous, say they’ve haven’t seen a tougher generation of youth since the city’s deadly mid-’90s. Floyd Wiggins Jr., chief of safety and security for Richmond Public Schools, told the Times-Dispatch, “I’ve never seen this level of aggression in 30 years.” In November, Superintendent Deborah Jewell-Sherman asked the School Board to station a police officer or deputies from the sheriff’s office at 15 schools. The board approved the request. Ross, of Juvenile Justice Services, says youth have always been impulsive and easily challenged. They feel assertive yet vulnerable, like they don’t fit in. For her clients, she says, “The really key difference is that guns are everywhere.” So disagreements, grudges and intimidation can escalate and become lethal. That some youth move along a positive path is amazing, says Richmond Hill’s Campbell. “But the stuff you’re flying against is so enormous,” he says. As for the rest of the population, why worry? “You’re dealing with having locked away 20 percent of the people; you don’t have to pay attention,” Campbell says. A county like Chesterfield can determine how far city buses enter its limits. A shopper in Short Pump can breathe in the newness of the place, while a poor resident in the East End may have no way to get there to apply for a job. But isn’t the entire region linked? We’d like it to be — sometimes, said Greta Harris, senior program director of Richmond Local Initiatives Support Corp., in an October speech. “In many ways,” Harris said, “we as a society want to have our cake and eat it too. … We want the good things associated with our core cities, as long as we don’t have to take on the full responsibilities of caring and growing their overall well-being.” Yet, she said, everyone shares in Richmond’s cultural identity. Already, there are good things happening, they say, pointing to lunch buddy programs, internships for inner-city youth, programs to strengthen families, church-based initiatives, anticrime efforts. But there needs to be a more sufficient infrastructure, Cohen says, with more cooperation, creativity and attention paid. It is not going to be simple or quick. Associate Editors Scott Bass and Brandon Walters contributed to this report.